The world No 1 enjoyed another incredible year of success throughout 2018, claiming 19 titles before being crowned world champion for a third time on New Year's Day. 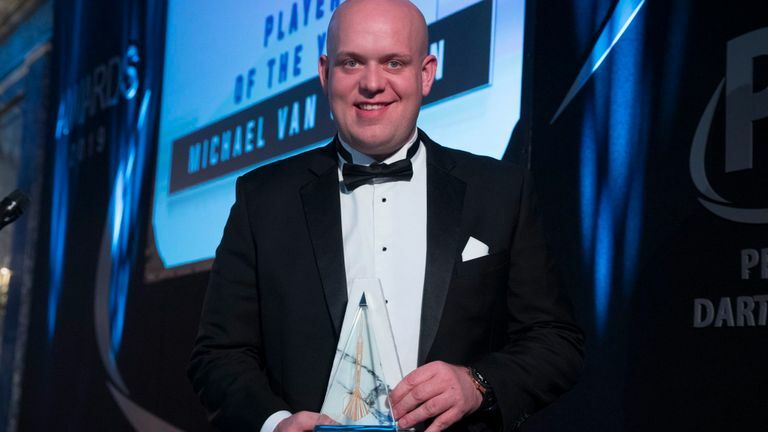 The Dutchman's achievements saw him win the prestigious player of the year for a fourth year in a row at the PDC annual awards dinner, while he also picked up the ProTour Player of the Year prize in recognition of his consistency throughout the year away from the TV cameras. The glittering awards ceremony saw World Matchplay and UK Open champion Gary Anderson rewarded with the fans' player of the year trophy, following a vote on the PDC's official website. The players' player of the year award went to Michael Smith, whose stunning performances saw him reach the finals of both the World Championship and Premier League before being voted by fellow PDPA members to receive their award. Luke Humphries was crowned best newcomer thanks in part to his sensational run to the quarter-finals of the World Championship, which saw him end Rob Cross' reign as world champion to conclude a memorable debut year on the ProTour. Daryl Gurney's dramatic comeback win over Van Gerwen in the final of the Players Championship finals saw the Northern Irishman rewarded with the best televised performance award. Max Hopp, the 22-year-old German Darts Open champion, was named as the PDC young player of the year after breaking into the top 32 for the first time.